On this page you will find the iGEM Wageningen 2017 Roll-out plan. 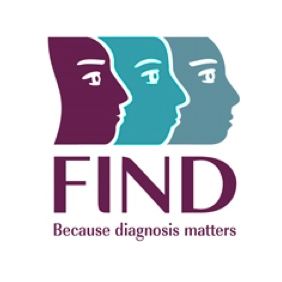 As shown on our project page there is a demand for accurate point-of-care diagnostics. But what steps need to be taken once it has been developed? How can you apply your diagnostic as efficiently as possible once an outbreak occurs? In this roll-out plan, you will find a coherent summary of the best practices for implementing your novel diagnostic, and the current issues found in the field of point-of-care diagnostics. To find out about these problems, we talked to several renowned authorities with different expertises concerning diagnostics and epidemics and combined their insights into the following overview of how a roll-out plan for novel diagnostics could and should work. We were inspired by the thorough analysis of possible scenarios, such as those of iGEM Pasteur 2016. Through this roll-out plan we aim to elaborate on their principle by incorporating our findings of the current practices. This way, we aim to help future iGEM teams by getting a clear overview of what human practices should be taken into account when designing and developing their new diagnostic. The first signs of an epidemic are noticed, for example by an increase in the number of people showing certain symptoms in a certain area. Often, this is noticed by the local or national health centers. When this is a new outbreak, little is known about the pathogen, vector, vector trajectory or the vulnerable target group. In the case of a re-emerging outbreak, these details are already familiar. In an outbreak scenario, the priority of the people should be assessing the identity of the infectious agent. What kind of pathogen are we dealing with? What are its transmission routes? How does it cause disease? When an official epidemic emerges, Mantis will be adapted to the new, spreading disease. During a new epidemic, the pathogen first has to be identified and isolated by authorized laboratories. The whole-cell biosensor can detect a pathogen by the antibody-like protein on its cell surface. This so-called ‘affinity body’ binds an antigen of the pathogen, whereafter the signalling system in the cell is activated, resulting in a detectable signal. The already made affinity body library, containing biosensors that theoretically can detect all possible pathogens, is screened for a suitable one for the new disease. This screening can be done within a few weeks. This selected sensor binds to the pathogen with the correct affinity and specificity. You can read here how this screening is performed. That’s it! A new whole-cell diagnostic test is now made. 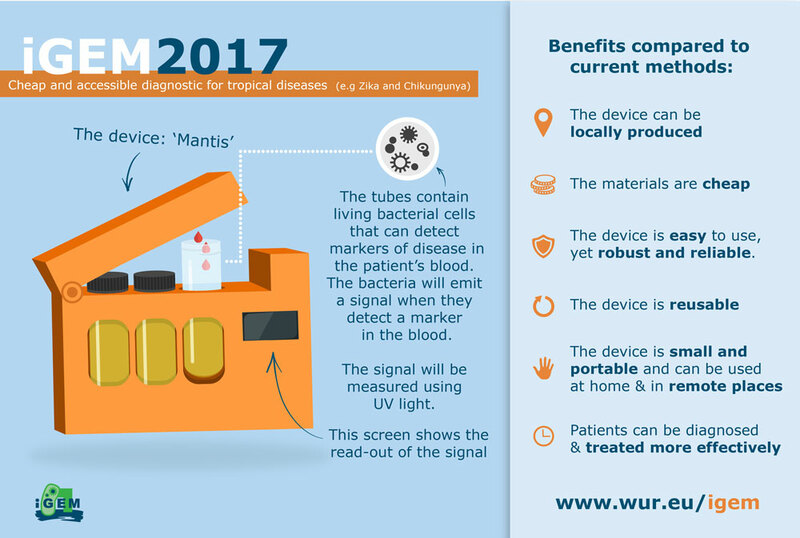 After the Mantis biosensor is adapted to recognize the new pathogen, this initial strain will be shipped to the place where it is needed, for example to the central cell bank of a country. From there, the strain is maintained and used to grow the biosensor on a large scale. It can then be distributed accordingly to the remote areas. When using the diagnostic test, the new cells are put into the Mantis device which gives a readout of the signal. This device contains, next to the disease-detecting cells, a negative control, and a positive control which detects IgG. The device can be re-used over and over and costs below the upper price limit the WHO determined. More information about the Mantis device, including a cost estimation, can be found on the device page. We also demonstrated how this device will be used on the Demonstrate page. Below, an infographic can be found describing the benefits of Mantis. After the new Mantis biosensor is made, it is produced on large scale. The production of current diagnostic tests is mostly based on enzyme purification, which is costly in resources and time . We learned from dr. Tatiana Mingote Ferreira de Azara, Health Surveillance Secretary of the Brazilian Ministry of Health that the current production of diagnostic kits is not sufficient for the whole population of Brazil. A current bottleneck is thus the limited capacity of production, and not the costs. This means scale-up of the production process is an important factor to consider. Since our biosensor does not need protein purification steps, this decreases its costs and production times. Hence, whole-cell biosensors are relatively easy and cheap to produce [2, 3]. For example, production and purification of antibodies can take up to 100 days , whereas a large batch of Mantis cells can be grown within a few days. Moreover, production of current tests like dipsticks depend on a small number of companies which do not make a lot of money from this, and thus have little incentive to continue. Mantis can be grown from a central cell banks in the tropical areas where the disease is spreading and thus does not depend on single companies for the production process. After the right affinity body is found for a rising disease, the bacterial strain is distributed to central, bigger health centers in developing countries as fast as possible. A primary health center, like the ones located in the capital city of a country, can be a good place to set up the master cell bank. From there, the cells are grown in large culturing tanks, dried and aliquoted in vials, ready for transport to more rural medical facilities. Whereas protein biosensors must be stored and transported refrigerated, dried whole-cell biosensors can be stably stored without the need of a cold-chain . However, one bottleneck could be the cell culturing step. This means that addition of a ‘cell culturing course’ to the medical training in developing countries will thus be a necessity. This would however be a step forward in creating a self-sustaining medical structure in developing countries and reducing the dependency on external help from developed countries. Su, Liang, et al. "Microbial biosensors: a review." Biosensors and Bioelectronics 26.5 (2011): 1788-1799. Raut, Nilesh, et al. "Engineered cells as biosensing systems in biomedical analysis." Analytical and bioanalytical chemistry 402.10 (2012): 3147-3159. Chang, Hung‐Ju, et al. "Microbially derived biosensors for diagnosis, monitoring and epidemiology." Microbial Biotechnology 10.5 (2017): 1031-1035. After production and preparation of Mantis from the central production plant, it has to reach the population residing in remote areas. After production and drying of the cells in health centers (see Step 3), the diagnostic is spread throughout the different tiers of the healthcare system  until reaching the local population. 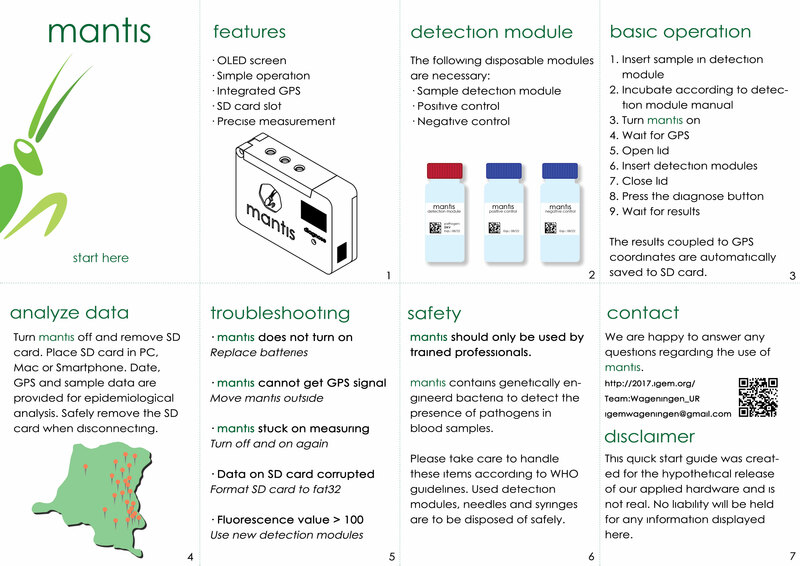 During the first-time distribution of Mantis in the area, the local facilities and field teams are supplied with both the Mantis device as well as the whole-cell Mantis biosensor. Owing to this model, only the biosensor itself needs to be shipped in subsequent rounds (aimed against the new disease), since the device is already present on-site. A manual how to use the device will be distributed as well. Below, more details can be found on the logistics in two distinct outbreak cases. In Congo, health care starts in local health centres (centre-de-Sante) which have staff ranging from basic levels of training to full-fledged experts. Secondly, there are hospitals and clinics staffed by medical doctors, which often provide definitive treatment. Finally there is a national hospital in Kinshasa. During active case detection, mobile teams travel to urban neighbourhoods or villages in rural areas to test everyone. This is needed since 70% of the population lives in rural areas . These mobile teams gather from a central point, e.g. local health centers, and go out with a four-wheel drive or motor bike for 20 days per month, testing around 6,000 people, depending on village sizes . Mantis can be used for both passive case detection in local health centers with minimal facilities, as well as active screening by these mobile teams. After independence of Congo in the 1960s, the healthcare system collapsed and the number of infected people increased significantly . Although increasingly more effort is put into control of epidemics in Congo, the health system has collapsed again after recurrent political and social instability since the civil war (1997-2003). Some estimated 5 million deaths between 1997-2004 were attributable to treatable conditions. Currently, the Democratic Republic of Congo is war-torn between the governmental military and rebel groups. Medical Entomologist Jeanine Loonen told us that negotiation with all the involved parties is necessary to maintain a functional healthcare system and infrastructure in these areas. To help, Médecines sans Frontières (MSF) set up a medical facility providing free health care and are asking the local population to help deliver medical supplies to healthcare facilities. The local population is thus an important partner in safe and effective transportation of the diagnostic here. More of these institutes, mainly based in Europe, provide free screening and medication to HAT patients. In Brazil, accessibility of healthcare facilities poses a smaller problem compared to Congo. Brazilian citizens can go to the doctor's office for free. However, these doctors do not have the expensive equipment needed to diagnose viral diseases. We learned this by talking to the local iGEM team (USP-Brazil). With Mantis, these local doctors can now diagnose patients! Mould-Millman, N. K., C. Stein, and L. A. Wallis. 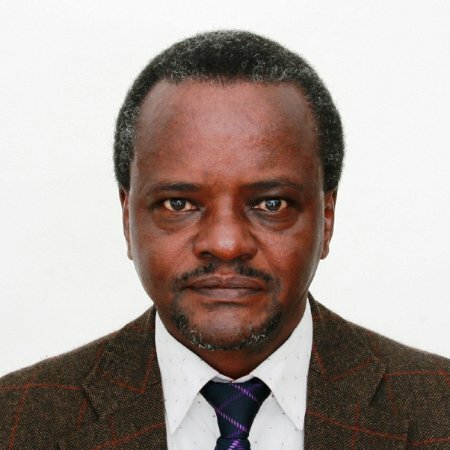 "Time to standardise levels of care amongst Out-of-Hospital Emergency Care providers in Africa." African Journal of Emergency Medicine 6.1 (2016): 54-55. Büscher. Philippe, et al. "Human African trypanosomiasis" The Lancet (2017). WHO Expert Committee. "Control and surveillance of human African trypanosomiasis" Vol. 984, WHO Press, 2013. The lack of financial support for programs attempting to combat neglected tropical diseases is a major issue. All aspects involved in gaining control over infectious diseases, be it medical supplies, population screening or vector control measurements, are virtually impossible without the necessary funding. When talking about diagnostics specifically, an additional financial hurdle is present: they have to be developed by third-party manufacturers who often want to make profit while keeping the price per diagnostic low and affordable. 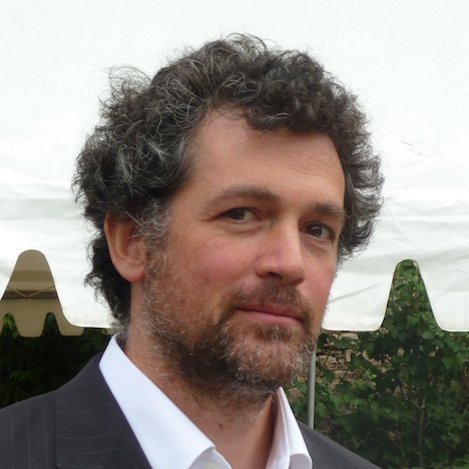 As was mentioned by MSF laboratory advisor Erwan Piriou: 95% of all malaria diagnostics, a tool that has proven to be extremely useful, are developed by only two companies worldwide. Since these diagnostics have to be affordable, prices have been going down for years, and so has the profit of the manufacturers. These manufacturers have been threatening to stop production if prices are forced down even more by the NGO’s, as they can not survive on the low profit margins. In the last decade the world's healthcare policy was focussed on the major infectious diseases HIV/AIDS, malaria and tuberculosis, resulting in allocation of the funding for the goal of controlling these diseases . Relatively unknown neglected tropical diseases (NTDs), like HAT, have been overlooked in financial support, partly due to their non-changing situation and seemingly low direct impact on population. Even though these NTDs are also in great need for funding, improving their situations is often more cost-effective and has added health benefits for the local society . 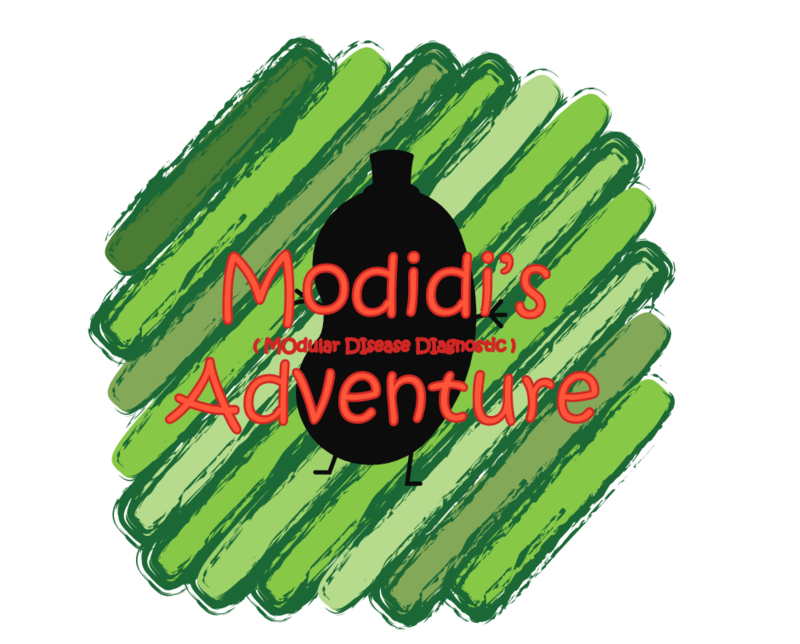 To support the efforts of tackling smaller, lesser known diseases, multiple NGOs have been established, often focussing on only a few diseases at a time. They play an important role in securing funding, setting up healthcare infrastructures, communicating with governments and evoking global interest in the diseases. When prevention of a second outbreak is the goal of the diagnostic, the difficulty lies in funding. Preventing recurrence comes down to screening in the field with said diagnostic, where mobile teams are then sent into the field to perform active case testing. Every year after the epidemic the mobile teams are sent to test villages poulations. If no case is found in 5 years after the last case, the mobile teams become active only once every three years. To overcome the funding problem, the WHO is setting up a list of Essential Diagnostics that should help maintain funding . Since the beginning of the 21st century, media coverage has proven to be an increasingly important factor in the attraction of funding for controlling infectious diseases. Recent outbreaks such as SARS, ebola and Zika have received more attention than similar diseases have a few decades ago. Funding for the Mantis diagnostic would rely on funding from global and national initiatives (e.g. World Bank, United Nations, National Institute of Health), which makes up the public sector. Allocation of funding from such initiatives is done in consultation with the WHO and other healthcare organizations, depending on factors such as the disease burden on society and the impact of the new diagnostic . The WHO monitors the global diagnostic infrastructure and decides whether a new diagnostic can and will be implemented. If it deems the Mantis diagnostic an improvement on currently available diagnostics they might, in cooperation with NGOs, allocate funding for it as well as identify potential manufacturers and implement it in the existing healthcare track. Molyneux, David H. ""Neglected" diseases but unrecognised successes-challenges and opportunities for infectious disease control." The Lancet 364.9431 (2004): 380. Mabey, David, et al. "Diagnostics for the developing world." Nature reviews. Microbiology 2.3 (2004): 231. Mantis is designed as point-of-care diagnostic, meaning that it will be used in the field. For this, personnel is needed. These people should be able to use Mantis safely and effectively, and communicate to the community why and how it is used. How does the health care system work in different areas, and what type of personnel will use the diagnostic? We looked into cases in Africa and South America. In African regions, training capacity of medical personnel is generally insufficient , which results in a shortage of healthcare workers in the government-run medical system. NGO’s like MSF are known to set up their own clinics and hospitals, dispersing health care free of charge. 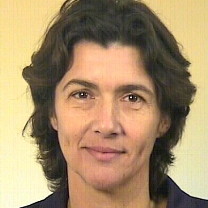 The hospital employs both foreign specialists and locals, in which the former educate the latter, as mentioned by medical entomologist Jeanine Loonen. With this system of basic medical education the Mantis device can be applied in the area by teaching the specialists the general use and mode of operation of the apparatus. The specialist in turn can instruct the local healthcare workers how to operate the device. In addition, a manual is available to clarify the handling of Mantis and to ensure proper use of the device. In Latin America, the degree of medical education differs greatly on multiple levels. Between countries the contrast can already be dramatic. Mexico, for example, has advanced in developing its national standards by investing in application procedures, instruments and facilities . Meanwhile, Venezuela is heavily affected by a healthcare crisis . 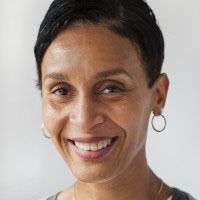 Furthermore, multiple occasions of certain institutions educating new healthcare workers which lack a minimal scientific and technical level in the process have occurred, leading to large differences in the capabilities between physicians . However, in most official healthcare institutions in urban areas, education levels are expected to be appropriate and implementation of Mantis in the system should not pose any problems as it is easy to use. Point-of-care diagnostic tests should be operated by primary healthcare workers without any formal laboratory experience and further training with the device should not take more than 2 hours [5, 6]. Hurdles encountered in later situations can be solved with the supplied manual, should training still be insufficient. Point-of-care diagnostic tests should be operated by primary healthcare workers without any formal laboratory training. Moreover, for any level health care worker, the training should be less than 2 hours. A significant number of infections can be prevented if the local population knows how to recognize symptoms of a certain disease and what to look out for. Mosquito-borne illnesses, with emphasis on Zika, dengue and chikungunya, are generally known by the locals, yet barely any of them was able to correctly assign symptoms to the respective disease . For example, dengue hospitalizes about 500,000 people a year of which 12,500 die as a consequence . This lack of insight should be addressed as soon as possible. Educational activities related to the relevant pathogens in the area should start as early as school begins for children. Both public health authorities and schools should join efforts to provide a basic and coherent model of how the disease in question affects the individual, how it spreads and what people can do to reduce their risk of getting infected. This includes, for example, wearing long-sleeved clothing at night, using anti-insect sprays and removing still water as much as possible. This should decrease the transmission rate and spread of the pathogen. The potential roles and responsibilities of school administrators will provide school districts with information for planning school-related activities for public health actions, pertaining to viral or parasitic infections. In turn, the provided information to children can be brought home by instructing the pupils to talk about the issue with their parents, which has had moderate, but effective results . Child care, camp and higher educational institutions are also considered for applying this model in the future. In conclusion, the guidance we made will give an overview of the potential responsibilities and roles of both schools and public health authorities regarding prevention measures that schools could implement in order to raise awareness of infectious diseases. Zika virus is used as a placeholder here. 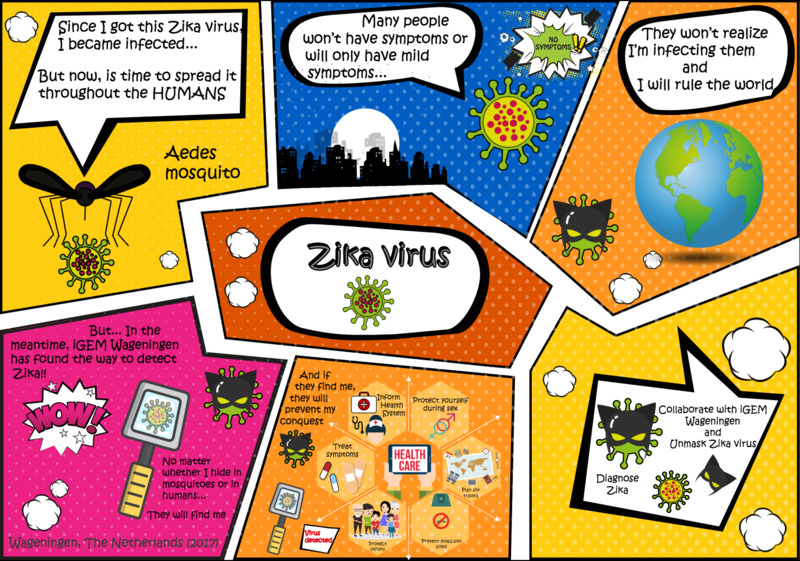 To reach the community, infographic tools could be implemented and used as a tool to inform students about current (Zika) concerns (Figure 1). Figure 1: Infographic approach to increase Zika awareness among students. Manufacturers will not have full control on the use of the Mantis device. It could be, for example, disposed of incorrectly, causing damage to the environment. Furthermore, it could be used in unintended ways, such as for discriminatory purposes within a village. It is the responsibility of both the producer and end-user to avoid any misuse(s) of the device. To that end, the labels should include instructions on how to operate it, how to dispose of it and what kind of behaviour is not accepted (e.g. obligate people to submit to a diagnostic test). This is something we discovered during our ethics research. As Mantis is based on genetically modified bacteria, it is of the utmost importance to take measures that will avoid an accidental release of the bacteria into nature. How can this be done, when the developers are not the ones using the diagnostic in the field? Firstly, the healthcare personnel will be trained to correctly dispose the vials containing the bacteria. Secondly, a biocontainment mechanism will be implemented in the genetic material of the bacteria, which will prevent the uncontrolled spread of the bacteria in case of an accidental release. Finally, the risk of the bacteria affecting the environment in a detrimental way will be assessed beforehand, to determine that it fulfills the recommended standards. To learn more about biocontainment mechanisms and risk assessment, look on our biosafety page. Even though we aim to keep all wishes of the patients into account when designing Mantis, we cannot influence whether they will use it or not. This is partly due to choices by health institutes that choose a specific diagnostic and due to the patient who can decide on being diagnosed or not. However, to what extent does this freedom of the patient go? Should the patient be in control, even if though they might carry a highly contagious disease? Decision should always be made by the patient, even though in developing regions there currently is a system where the health authorities decide. In normal conditions there is no need to inform the patient about the technology behind the diagnostic, but we should inform about the GMOs when this is a sensitive topic in those countries. In case of a severe epidemic, diagnostics cannot be imposed. Depending on the status of a disease, however, local governments can take measures to separate a patient from healthy individuals. Nonetheless, this scenario is seldom applied, as the diseases for which these measures are allowed are extremely scarce in number. Read our ethics page to see the complete story of how we came to these conclusions. In addition to approval of global healthcare organisations such as the FDA and WHO, implementation of a new diagnostic also requires governmental approval from the country it will be implemented in. This approval is based on trial results obtained during initial testing of the diagnostic during development. The specific requirements for a diagnostic to gain approval varies per country. Unfortunately, these regulations are lacking in strictness for a large number of countries. As a result, the wrong choice for diagnostics is easily made, resulting in costly mistakes in clinical decision making . Especially in developing countries, these regulations are insufficient due to the absence of a qualitative good healthcare system. Mantis aims to improve this situation, by becoming an affordable alternative, while still retaining a high level of safety and well-documented regulation. Once the tests have been performed, the group tested positively for the infections will be sent to the hospital for further testing and/or treatment. We found that this process could be improved in some situations. For example, the current tests for HAT are still troubled by a high false positive rate (up to 99%) and even false negatives . This means that for all positively tested persons in a village, further testing is necessary through microscopic analysis on-site and extensive confirmation tests and staging in nearby hospitals. However, since many more patients are sent for further testing than is actually needed due to the false positive result of the screening test, this will increase costs for the involved NGO(s). 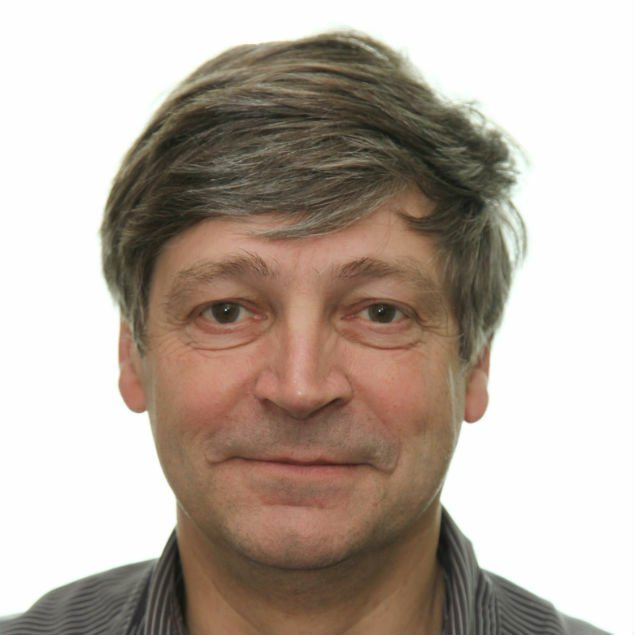 According to dr. Philippe Büscher (Head of the Unit of Parasite Diagnostics, Institute of Tropical Medicine, Antwerp), the current treatment and healthcare costs are US$100-200 per patient. Therefore, by decreasing the number of false positives, a lot of money could be saved which can then be more efficiently spent to help those in need. By making a more sensitive diagnostic test, we aim to reduce the number of false positives. Hereby, the costs for research, equipment and health care is also reduced, while still helping those in need! Büscher, P., Cecchi, G., Jamonneau, V., & Priotto, G. (2017). Human African trypanosomiasis. The Lancet. Diagnostic tests can be widely applied, e.g. for deciding on treatments for a patient, evaluating current interventions and for surveillance for disease presence (see below). However, this is not possible if the tool does not work properly! Not all diagnostic tests are suitable to be used in the field. To find out how the test can be best put into use, evaluation is necessary. Here, we address ‘outbreak-use’ diagnostics (OUDs), discuss the definition of an OUD and what its role is in tackling outbreaks of infectious diseases. In the case of an emergency outbreak, the distribution of a safe and effective diagnostic to the patients in need is of the highest priority. Therefore a preliminary ‘outbreak-use’ diagnostic is developed and applied in the field as soon as possible . This OUD is used to determine who is infected, how the disease is transmitted and how the disease is spreading. This data is of utmost importance for the development of containment strategies, and these can in turn be applied for limiting the number of casualties. However, such a test has not gone through extensive performance trials yet. These trials would have taken valuable time during which the epidemic could have caused many victims. Instead of figuring out all the best practices of the OUD during long clinical trials, the performance and main best practices are mainly discovered in the field in uncontrolled environments . We learned that this is the scenario where Mantis can be applied best. A modular tool sees use when there is an outbreak of a pathogen where no convenient diagnostic already exists. The device should have advantages that make it attractive to use, for example cost-wise or through ease of use. Through evaluation of these practices and the data on the health threat, diagnosis can be improved and the disease can be tackled more efficiently. Mantis facilitates collection and sharing of this data, by e.g. clear labeling and data storage on a SD card. See more on the device page. Gathering this test performance data also facilitates approval of the diagnostic for later use by the WHO . How do you know if your OUD functions according to expectation? How can you ensure maximum specificity and robustness of your device? For this, the World Health Organization (WHO) has developed guidelines. The basic requirements for a diagnostic test are collected in the ASSURED program (Affordable, Sensitive, Specific, User-friendly, Rapid and robust, Equipment-free and Deliverable to end-users), developed by the WHO in 2003 . If these criteria are met, the diagnostic can be applied for use in the local area. Performance tests are still required to improve its weak(er) points through a continuous feedback loop with the field team. A diagnostic test that would fit these demands would be of great value for neglected diseases like HAT . WHO, WHO to develop Essential Diagnostics List, World Health Organization, 15 June 2017, www.who.int/medicines/news/2017/WHO_develop_essential_diagnostics_list/en/. Cowan, Elliot P. "A framework for the assessment and implementation of diagnostics in outbreak situations." African journal of laboratory medicine 5.3 (2016): 1-6. Once an outbreak is over, one would conclude that the situation is relatively safe again and the danger of infection is minimized. However, the infective agent can always re-emerge and spread through the population again. To make sure these resurgences are noticed early on and handled quickly, detection kits are once again necessary. These are mainly used for ‘case finding’ in the population. After the big peak of the epidemiology, diagnostics are still applicable but only risk groups relevant for the disease will be diagnosed. This requires characterization of the disease. From dr. Marianne van der Sande we learned that it is hard to predict where an epidemic might reoccur. This is due to the fact that pathogens can have a diverse effect on each segregation of the human population, by the different genetic makeup of each different person and due to corresponding resistances. When prevention of an outbreak is the goal of the diagnostic, the difficulty lies in funding. Preventing recurrence comes down to screening in the field with diagnostics which requires expertise and material over a long period. We learned from dr. Erwan Piriou that although plenty of funds become available for diagnosis and eventual medication when the epidemic is still relevant, it seems these funds are not available anymore once the danger has passed. This sadly results in recurring epidemics, which could have been prevented by more effective screening. 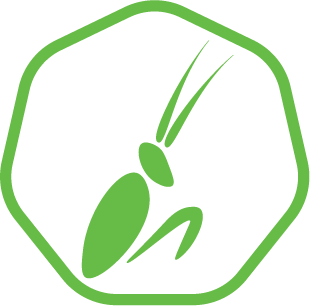 By building Mantis in a local community on low costs, and facilitating big data gathering, we hope to facilitate monitoring and make it more available for the public.